The mystique of the sea calls to many. Those living in Tampa have a unique opportunity to delve beyond the surface and get to know the creature of the deep. At the Florida Aquarium, exhibits and education stimulate an interest in conservation of the oceans and care of its wildlife. Two levels of exploration await at 701 Channelside Drive. Open everyday there's loads of time to explore. Creatures great and small thrive here ranging from cuddly otters to fearsome sharks. Upside down jellies are silly in appearance and found in the Bays and Beaches exhibit. Also in this space visitors will find stingrays, garden eels and spiny lobsters. A favorite swimmer here is the green sea turtle who gracefully slips through the water. Madagascar reefs are brimming with aquatic animals in Journey to Madagascar. Reef fish swim about in a rainbow of colors by giant clams. Ring tailed lemurs earn laughter with their antics and the Madagascar gecko can be hard to spot. Follow the Wetland Trail and find animals who are comfortable living in Tampa in the water and on the land. River otters amuse each other and their audiences seeming to play all day. American alligators take their top of the food chain title quite seriously. Burmese pythons slither around the landscape waiting for prey. Over in the Coral Reef tiger and nurse sharks call Tampa home. Brave souls visiting the building can actually dive with these majestic creatures. 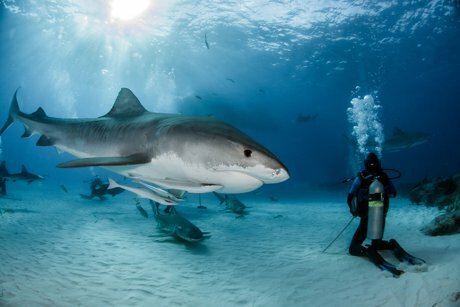 Read more about checking off diving with sharks on your bucket list here. Dragons Down Under showcase a variety of sea dragons and seahorses. Learn all about these amazing creatures and their unusual habits. The giant octopus amazes many with his mysterious movements and size. Families strolling about in the warm summer months can let their kids cool off on the splash pad. When hunger strikes it’s easily satisfied in Cafe Ray. The onsite restaurants boasts a menu filled with sandwiches, pasta, pizza, salads and paninis. Pre-planners can purchase tickets on the website and skip the lines at the Florida Aquarium. Check out a map of the grounds and plan your day even further.